in the form of a caravaneer’s water ﬂask, moulded in high relief with two Central Asian musicians ﬂanking a smaller Central Asian dancer, the men all wearing belted tunics and baggy pants tucked into high boots, one musician playing the ﬂute and the other clapping his hands, both with long curly hair and “foreign” features, the shorter ﬁgure in the center wearing a peaked fur cap, the identical imagery repeated on the two wide bulging sides of the ﬂask, framed by studded vertical borders and surmounted by pendant clusters of overlapping petal motifs symmetrically arranged on the steeply sloping shoulders below the ﬂattened tapering neck with thick oval mouth, the dark olive-brown glaze generously applied, shading to amber brown in some areas and continuing over the solid pedestal base showing spur marks from the kiln support, with remains of pale buff earth from burial. 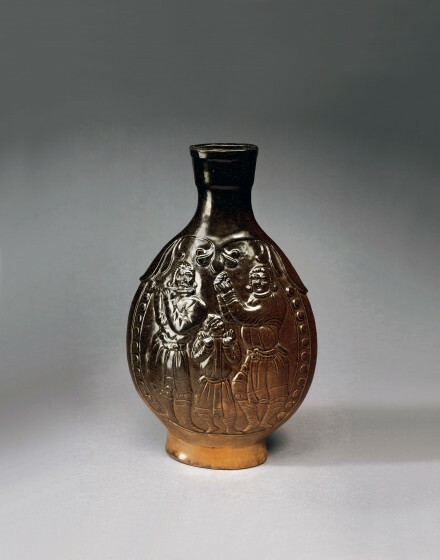 A glazed pottery ﬂask of closely related form decorated with a relief-molded design of a Central Asian ﬂanked by two lions is illustrated by Kao Shoutian in “A bianhu decorated with human ﬁgure and lions unearthed at the western suburb of Taiyuan City, Shanxi”, in Kaogu, 1963, No. 5, p. 263. The same ﬂask was included in the 2005 exhibition at the Metropolitan Museum of Art and illustrated by Watt in the catalogue entitled China: Dawn of a Golden Age, 200–750 A.D., New York, 2004, p. 148, no. 148. No other example of this large size and unusual form appears to have been published, but a group of four smaller brown-glazed ﬂasks each with shield-shaped body moulded in relief with Central Asian musicians and a dancer, were discovered in 1971 at Anyang, Henan province in the tomb of Fan Cui, a high ofﬁcial at the Northern Qi court who lived from A.D. 549 to 575, and one of them was included in the 2005 exhibition at the Metropolitan Museum of Art, op. cit., p. 149, no. 149. The ﬂask was ﬁrst documented in “Brief report on the excavation of the tomb of Fan Tsui of the Northern Qi period at Anyang, Henan Province”, Wenwu, 1972, No. 1, pp. 47–57, pl. 7. Other smaller examples of the same form and design as the ﬂasks in Henan are recorded in the Metropolitan Museum of New York, from the Falk Collection, and in the Museum of Fine Arts, Boston, from the Hoyt Collection.